DHT is killing your hair follicles. It shrinks them so that they can no longer make healthy hair. That’s why you need one of the best DHT blocker shampoos to protect your scalp. The shampoos stop the formation of dihydrotestosterone and prevent it from binding to the follicles. If you have androgenetic alopecia, you have a problem with DHT. This type of hair loss is also known as pattern baldness. It affects women and men regardless of how much or how little testosterone they have. It only takes a small amount plus the help of the enzyme 5-alpha reductase to produce DHT. Therefore, if you have an imbalance of hormones due to pregnancy, menopause, illness, or certain medications, you’re more likely to suffer hair loss. A DHT-blocking shampoo may be just what you need to counteract the problem. Moreover, these shampoos tend to be mild, moisturizing, and packed with hair growth nutrients. We chose the best DHT blocker shampoos to review them here for you. We hope this article helps you find a new shampoo to help your hair grow back healthy and thick. 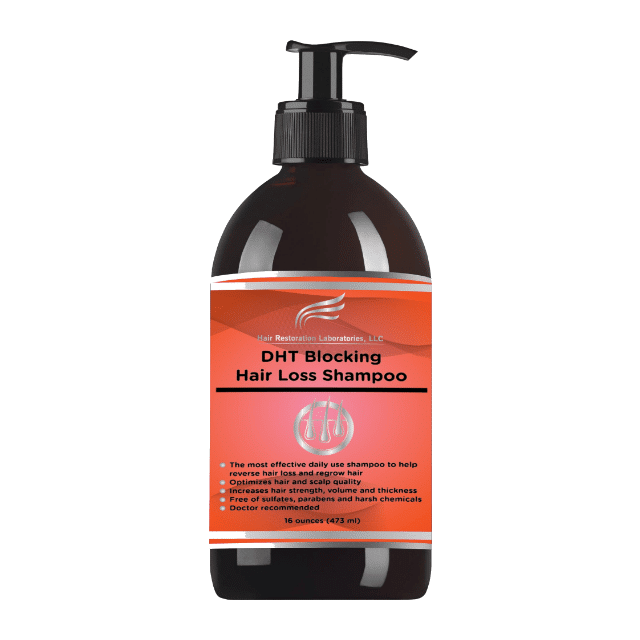 The DHT-blocking shampoo from Hair Restoration Laboratories employs twenty-one ingredients that eliminate DHT from your scalp and nourish your follicles to keep them healthy. Even after only one use, you should notice a difference in your hair. Then over the next few months, you should see less hair loss and thicker, shinier hair. One key to this shampoo’s success is that it lacks drying sulfates and other irritants like parabens and silicones. Alternatively, it’s packed with natural extracts that moisturize and provide nourishment to your skin and hair. They also stimulate new hair growth. These nutrients include rosemary and argan oils, biotin, vitamin E, and tea tree oil. Rosemary, for example, is excellent for blocking DHT. And argan oil, biotin, and vitamin E strengthen the hair and scalp. Just as important, you can continue to use topical treatments like minoxidil or oral supplements while you use the shampoo. The Pronexa Shampoo from Hairgenics is part of a hair care system that includes conditioner, serum for the scalp, and oral supplements. It’s all targeted at halting hair loss and encouraging the growth of dense, lush locks. Of course, the process takes months. But the Pronexa shampoo starts working on day one. The shampoo contains the DHT-blocker Saw Palmetto plus certified organic ingredients like aloe and seaweed extract. While the aloe and seaweed provides moisture, the biotin strengthens existing hair. It also promotes the formation of stronger strands. Pronexa is for both women and men, and it’s backed by a 100% money-back guarantee. Watermans Hair Growth shampoo comes in a set with a conditioner, too. It’s a popular product in the United Kingdom among women and men. Since it contains rosemary, it stops DHT from binding to the hair follicles. Moreover, the gentle formula lacks sulfates and parabens. As you use the Watermans shampoo regularly, you should see more shine and bounce in your curls. That’s because it has argan oil, biotin, and allantoin to revitalize the hair. Meanwhile, caffeine stimulates the scalp. The Maple Holistics shampoo focuses on biotin, also known as Vitamin H. While you can take biotin by mouth, it also helps topically. It strengthens the keratin that makes up hair strands. But this gentle shampoo also removes DHT from your scalp with natural extracts of rosemary and mulberry root. In addition, there are no parabens or sulfates to irritate or dry out your skin and hair even if you wash every day. Furthermore, if you have dandruff, this product can help. That’s due to the zinc in the formula. And you can try it risk-free as Maple Holistics offers a full refund if you’re not satisfied. Thousands of reviews appear to say the same thing about the Hair Surge Shampoo from Ultrax Labs. It can help regrow healthy hair. It starts by blocking DHT with saw palmetto. In actuality, saw palmetto stops that enzyme, 5-alpha-reductase, from forming DHT from testosterone. Then the caffeine micro blend goes to work waking up your hair follicles and increasing blood circulation. Finally, ketoconazole, an anti-fungal, reduces any inflammation and wards off dandruff. For best results, combine this shampoo with other products from the same line. Arctic Hair wants to speed up your hair growth with a huge dose of caffeine. Plus, it blocks DHT to stop the problem at the source. Then it uses potassium, an oxygen complex, and B vitamins to nourish your scalp and strands. But there are other interesting ingredients in the bottle. The first is geothermal kelp and ancient amber extracts from Iceland. Second, there is tea tree, a natural anti-fungal, and anti-inflammatory. And third, there is witch hazel, a moisturizing astringent that helps open hair follicles. In summary, while the list of natural components continues, you also need to know that this is a vegan shampoo that’s free of sulfates and never tested on animals. What is a gel shampoo? Earth Chemistry will show you. Their mineral gel and sea salt formula comes in a jar, not a bottle. It’s packed with rosemary and peppermint essential oils that revitalize your scalp and hair during the first use. And some people say it creates an amazing amount of lather considering that it lacks sulfates. Why might you try this shampoo, other than the novelty factor? It’s because it’s volumizing and cleansing for limp, greasy hair. It removes buildup from the scalp with a fresh cooling sensation that makes every shower a spa experience. Majestic Pure’s hair loss shampoo covers all the bases to make sure it gets DHT away off your scalp. It contains three blocking ingredients: saw palmetto, nettle extract, and the Chinese herb Fo-Ti. But if you’re pregnant, talk to your doctor before you try this product. It’s that strong. The non-GMO ingredients also include a B-complex of vitamins plus biotin. But there are no parabens, no sulfate, and no gluten in the bottle. Furthermore, Majestic Pure offers a money-back guarantee. PURA D’OR clinically tested their shampoo to see how well it stopped hair from thinning. The tests revealed that it also improved volume, thickness, and shine. Participants had less breakage and stronger hair. The first ingredient is aloe, not water. Then the rich formula also contains vegetable oils, antioxidants, moisturizers, and DHT-blockers like nettle leaf and rosemary. Like other products from the same company, this shampoo lacks parabens and sulfates. It’s hypoallergenic and cruelty-free. Additionally, select components are certified organic. Paisle Botanics was created by a team of scientists and hair stylists to treat hair loss in women and men. It blocks DHT while it encourages new hair development. And it moisturizes and strengthens hair from the first time you wash with it. As you read the label, you’ll find it has a lot in common with similar shampoos. It focuses on biotin and argan oil to reinforce brittle strands and thicken the hair. But it also uses caffeine to invigorate follicles. Plus, there’s coconut oil, a natural moisturizer for both hair and scalp. You won’t need to worry about sulfates, phthalates, phosphates, parabens, formaldehyde, or even salt. Also, it comes with a 100% money-back guarantee. Lipogaine’s color-safe shampoo combines the power of saw palmetto, nettle, biotin, argan oil, caffeine, and castor oil to tackle all the usual problems associated with hair loss. But it includes a few things that other shampoos don’t have. For example, there’s ylang-ylang, another traditional remedy for hair loss. In fact, the rest of the label reads like a herbalist’s shopping list of cures to grow shiny, healthy hair with more volume. Should it not work as well as you hoped, it’s covered by a 100% money-back guarantee. Amplixin’s Stimulating Shampoo treats receding hairlines as a temporary obstacle. That’s because it employs a proprietary technology called AmpliGro. That’s a combination of caffeine, red clover, and biomimetic peptides. It blocks DHT while it delivers nutrients to the roots of your hair. Besides, this sulfate-free shampoo is safe for everyone in the family to use. Shapiro MD gives you 60 days to try their shampoo. If it doesn’t work for you, it’s covered by a money-back guarantee. Since it contains saw palmetto, caffeine, and EGCG, it should put a stop to hair loss caused by dihydrotestosterone. Moreover, the doctor-developed formula also has important nutrients that nourish hair and scalp. The Amaze shampoo from Maple Holistics encourages hair growth by stopping DHT and reviving follicles. It contains a host of nutrients like biotin, zinc, green tea, rosemary, mulberry, coconut oil, and more. It removes flakes and stimulates the scalp to make hair feel stronger, look shinier, and grow in thicker. If you don’t see the difference you desire, they offer a money-back guarantee. The Roots Shampoo combines five natural DHT-blocking ingredients to make absolutely sure that it’s protecting your hair follicles. Those ingredients include red Korean ginseng extract, caffeine, lupine protein, soybean isoflavones, and biotin. It’s such a potent shampoo that you should notice a positive difference in the appearance of your hair after only one wash.
Science’s understanding of hair loss has improved over the past decades. As a result, it’s easy to find a DHT blocker shampoo that can help you regrow your hair. Most formulas lack harsh chemicals and focus on natural remedies encourage healthy hair growth. We hope you discovered a new shampoo to try today.